Vitamins. Should you take them? There was plenty of talk about vitamins and minerals from the different famous guest faculty teachers at my recent training from the Institute For Integrative Nutrition. Most of them highly recommended supplementation. Why? Well, in a perfect world we would get all of our nutrients directly from food. The problem with that route is our soil is usually overworked and depleted. And who really knows what’s going on with the GMO food situation. Add to this the fact that most Americans are expected to get their vitamins from fortified, gluten containing cereals, rice and bread. So with a few exceptions, those that eat gluten free may be vitamin and mineral deficient. Top it all off with the fact that we have sensitive tummies that may find it hard to break a vitamin pill down. This is why Wellesse liquid supplementation products may be a good choice. Your tummy doesn’t have to break down a pill and the liquid is more likely to be properly absorbed. Makes sense. As you may know, I personally have benefited from taking vitamin and mineral supplements. And some of my clients couldn’t believe what a difference in energy they had from just taking a multi-vitamin. Yup. 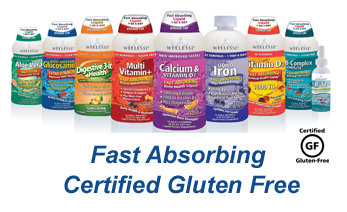 Wellesse products are tasty and convenient. The cap is a dosage cup and they can even be blended into water, juice or smoothies. Easy! So, I’m excited to have arranged with Wellesse for one of my readers to…. Win a Wellesse Basket of Health valued at $250!!! Whooo Hoooo! How’s that for making vitamins fun?! I’d love to win the vitamins for my 13yo old who has celiac disease. I think they’d help her overall feel better. I have been having trouble with vitamin pills – maybe liquid is the way to go! There is a saying that “An ostrich sticks his head in the sand and wonders why it is dark”. Each of us needs to take advantage of every opportunity to improve our health and well being, especially when a new and improved product is available that can make a significant improvement for all of us. I will love to try this!!! Wow. What a great thing. Thank you Kelly and thank you Wellesse. I, too, have benefitted from good, gf vitamins. It makes a big difference. Would love to try these products. Kelly, thank you for your hard work. Looks like a fun gift basket. Maybe that would give me a pep up, hope I win! i would love to win these for my sister who is highly gluten intolerant! I am VERY interested in your products and hope I win so I can try them all! Thanks for being so generous and offering this give-away! I LOVE that these vitamins are certified GF. I would be so happy to win these, my immune system is down right now to a recent accidental gluten contamination and I know this would help! Would love to try the liquid vitamins! Many vitamins bother my stomach – hope this would help! I really like to win, since it is my birthday on the 29th, and I’m feeling a bit worn-down and old. Would love to try these vitamins! Was so excited to see this opportunity to win something & try something that I feel is needed in my life!! Thanks for the opportunity and the valuable information, as always. I would truly appreciate receiving these vitamins as I have been trying different calcium/vit D products with limited success. Thanks! Gluten-free is good for me! I would love the opportunity to win this basket, it looks amazing. Very excited to read about Wellese premium liquid vitamins. With type 1 diabetes, celiac and DH I have been overwhelmed with all the changes falling short on researching vitamins. Thank you for this information on a company and product that sounds just perfect for me. I sure need some G-F vits. to help me out of this current slump. I have been diagnosed with Internal Celiac and external, called Dermatitis Herpetiformis, and then on top of that Chrone’s disease. It would be wonderful to win this and see if my immune system can perk up some on these. I know that I am mineral deficient, and likely vitamin-deficient, also. I’ve been very curious about liquid supplements, and would love to win these! This is fun — thanks, Kelly! I would love to win these vitamins! I haven’t found any that I love since my diagnosis…maybe these are the ones! It would be nice to win. Haven’t ever taken liquid vitamins. The GF is a must. I know I don’t eat enough in my GF diet to get everything we are supposed to. I would LOVE to win these vitamins as I am always on the lookout for more readily absorbable vitamins! I would love to try these out! Thanks for the give away! I would LOVE to win this! I am in health industry and am constantly upping my vitamins to keep up with my job! I would LOVE to save $$$ by winning this! Thanks for sponsoring such an awesome offer! Oh MY!!! these sound wonderful!!! I would be so thrilled if I could have an opportunity to try these vitamins. Thanks for the opportunity! 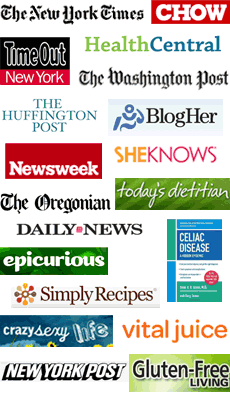 I just found out that I have Celiac, and am looking for ways to start my new food and nutrition journey. This looks like a product I should try! Thanks for the chance to win! I would love this. I haven’t taken multis in a couple of years now because of the cost.